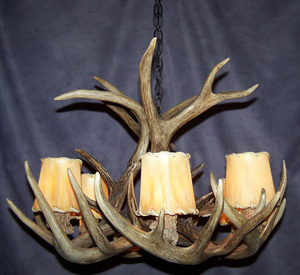 Naturally shed high quality White Tail antler chandelier, 24" in diameter, 16" high, 6 lights. Rawhide shades available at $36 ea., parchment $22 ea. Click on icon for options. 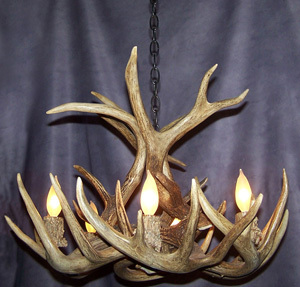 Wiring and junction box are completely concealed within the antlers. Certified in the USA and Canada for your protection and compliance with building codes. Approved for 60 Watt bulbs. 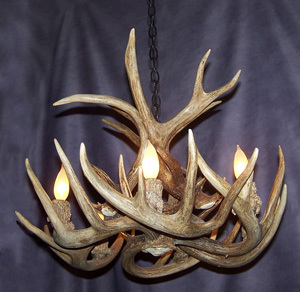 Ceiling canopy and mounting hardware included. A downlight can be added for an additional $70.